The first one I saw was online. Just a picture. 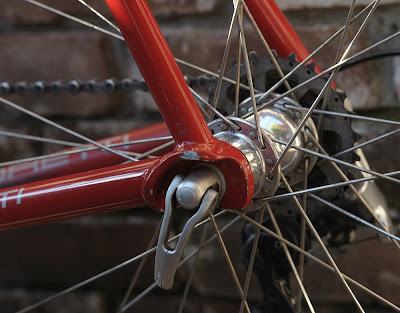 I read a story about the man who built it, and I looked at the paint, the welds, the straight-gauge tubing. 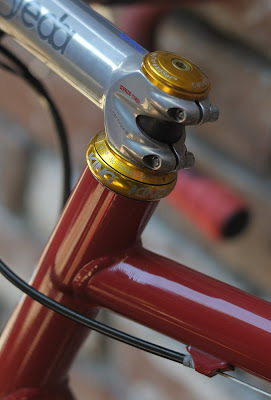 Pegoretti. It seemed too old-school, too pretty, too artsy to really use. I wanted one to hang on my wall. As art. Then I saw one in person at Chad’s shop, Above Category. This was a year and a half ago. He had about 2 dozen of them lined up along the wall. They were incredible! I decided to buy one; a Columbus 7005 aluminum 8:30am, 59cm. I planned on using it for social rides, thinking it couldn’t possibly compete with the featherweight carbon race frame I was on at the time. 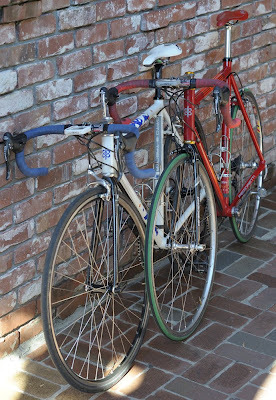 A few months later, in December, my mass-market race frame had developed numerous cracks and in need of a bike for training I swapped all of my campy components over to the brand new Pegoretti. The first ride was a revelation. I never looked back. And now, after close to 9,000 miles on my 8:30am, I can say with conviction that I'm a true believer. Of course I had some mishaps. The unthinkable happened, and then happened again. I crashed my Pegoretti a few times over the season but it kept on delivering. 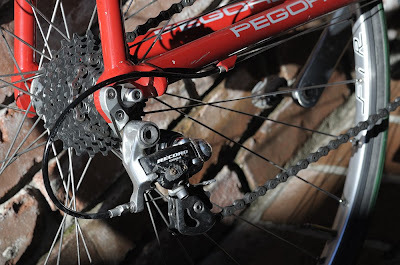 Above, my rear derailleur shows some wear from a slide in Stage 4 of the Mt Hood Classic. 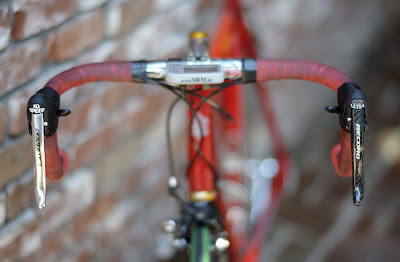 I started with a pair of Chorus shifters. I wore through one, and then crashed the other, and replaced them with what I had on hand. 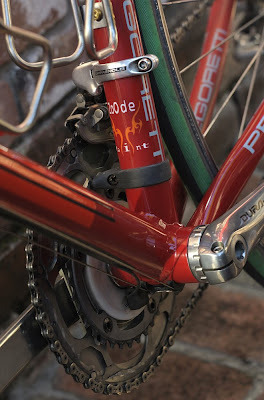 The bike as I raced it (usually with Reynolds DV46 Tubulars), weighed about 16.75 pounds, including an SRM powermeter. In training, depending on wheels and extras, it weighed 17.5-18.5 pounds. I won my first two road races of the season on it. Any doubts about an aluminum Pegoretti’s viability for competition were officially demolished. The first one was a solo breakaway, and for the fifteen minutes between launching my attack and crossing the finish line, I thought a lot about this man Dario who had poured so much love and expertise into the frame I was rocketing towards my first California victory. It was an inspiration, to say the least. I’ve since had the pleasure to get to know him on a couple of occasions, and my respect for him has grown with every meeting. 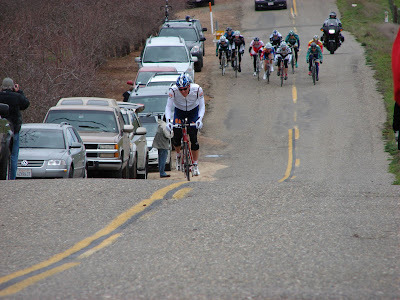 Coming in for the win at Snelling Road Race in February, 2008, on my Pegoretti 8:30am.